To Book Please Call 520-429-1956:::: THIS HOUSE IS FOR SALE.....Resort Style Riverfront Living. 4 bed/5 bath, four masters. 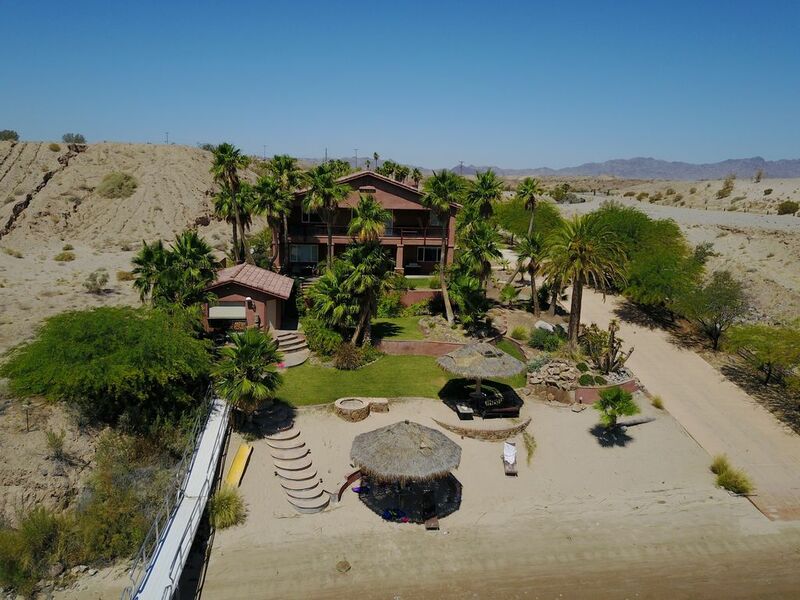 2.47 acres w/157' of river frontage, private launch ramp and dock, sandy beach with gas firepit, grass area, wet bar/casitas structure w/fireplace for entertaining, 3490 s.f. living area, two fireplaces, wet bar, center island all stainless kitchen, granite counters, tile floors, wine cooler/wetbar, courtyard entry, laundry room, security alarms and much much more! Completely Furnished. , . So here I am as a Dad remembering what has been special in my life and how I would mark my young ones present. The goal was to brighten their imagination by mining for gold, playing games, representing the prettiness of nature, and so much more. Well, so much more was easily accomplished and it was due, in part, with the help of this great house that was family friendly at every turn. The location of this house allowed us to make it up the river one day, down the river the other, and west through the desert in a few others. With this house, I did not need to own a boat or an ATV. The location was central enough for Jason, through his great customer service and at Sand Bar Watersports, to deliver the recreational vehicles, boats and ATV's, we needed to augment our experience. If you add, the best fireworks sold this side of the Mississippi, then you have fun from dawn to dawn. The house was clean, beautiful, well maintained, and I strongly recommend and I would not doubt if my young ones one day bring me and my wife as a part of how they will brand their young ones present! Thank you, please have is back. Our July 4th week vacation with family and friends was wonderful! Aside from the resort like property, the owner, Corri, was readily available via phone or text to answer any questions we might have. The house and property was immaculate and comfortable. The private ramp made getting "the toys" easily in and out of the water. The dock allowed easy access to the boat. The night of our return I texted our daughter-in-law saying I missed the "river house". Would love to return soon! Rhonda, Thanks so much for treating our vacation home so great! I love to rent to families like yours. I hope you had a great time and made some great memories. I can think of a few, ....Hope to see you next year.